Across America in 70 days, on nothing more than a bicycle. That is the feat accomplished by Delta College student Bobby Miner, 20. Despite having faced a flood and a snowstorm along the way, he endured. On April 1, Miner left Stockton en route to Buffalo, New York. “My grandpa kind of inspired me. He’s done Canada, Florida … I just wanted to travel,” Miner said. His grandfather, though highly supportive, had his concerns. “Because I was alone, I think he was more scared. A friend of mine was going to go but he ended up bailing,” Miner said. Riding solo, however, was no concern of Miner. This was his third biking trip. 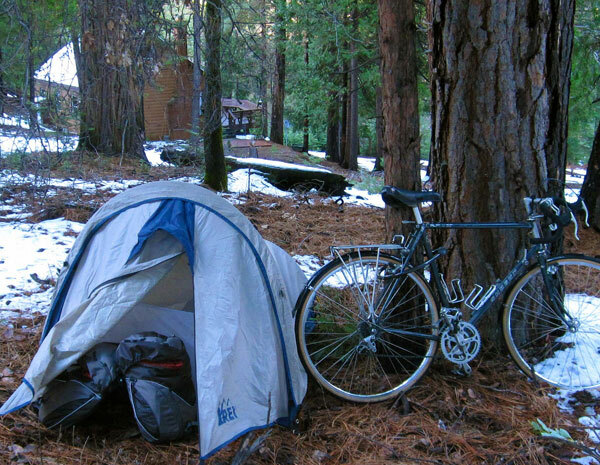 And he was prepared, packing the essentials: Small tent, sleeping bag, few articles of clothing, bike tools, a small stove, and above all – a Kindle, to send e-mail to his friends and family. No adventure comes without danger, and Miner’s was not immune. Soon into his trip he confronted a snowstorm in Nevada. His body gave out to where he felt he could bike no longer. He waved down a car and hitched a ride from a woman and her son. “I tried speaking to her but I couldn’t even speak because I was so cold,” he said. He was driven into a nearby town and stayed in a motel that night. In New Hampshire, Miner encountered further peril. He camped out – despite two tornado warnings and rain. All his electronics were ruined, including his beloved Kindle. He then had to resort to computers in public libraries to keep in contact with friends and family. “In retrospect, I should’ve gotten a hotel that night,” he said. In spite of the terrible weather, Miner met plenty of kind people along the way. “I’d meet random people in public when I was getting groceries and talk to them. Sometimes they’d offer me to stay with them,” he said. The generosity was a subtle surprise. Some even cooked meals and washed his clothes for him. “People were nice,” he said. A family in New York, along with others who have made an impact on the trip, are not forgotten by Miner. He continues to keep in touch with them via e-mail. Upon making it to Utah, Miner visited Zion National Park. When finally making his destination, Miner enjoyed some well-deserved leisure time at Niagara Falls. There he witnessed the daredevil Nik Wallenda walk a tightrope across the falls. Miner continues to bike today, trips to school included.